Each season we do a small number of weddings and events. These flowers are grown here in Maine using sustainable practices and reflect a time and place. We offer three options for events full design, DIY bulk buckets, or a hybrid of the two. If feel our farm flowers would be a good fit for you please reach out to us. Thank you, we look forward to working with you. We’ll be in touch shortly. Every year we grow more and more flowers to take us through the winter months. We have yet to grow enough. We sell these at fairs in Maine in the fall through the winter holiday season. We also are happy to ship them around the country. Please visit the shop to see what’s in stock. 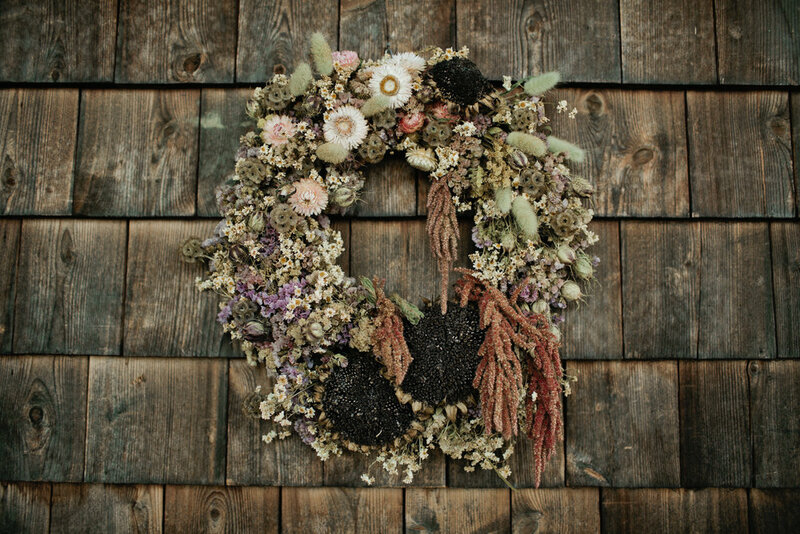 For the 2019 season we’ll be offering a variety of workshops from May-December from spring bouquets to dried flowers designs to evergreen wreaths. We’ll be sure to post more on our Facebook and Instagram accounts. Or if you’d like to be added to your mailing list for a heads up on these events and more share your email with us. We’ll be posting more about our flower shares soon. Please be check back. If you’re interested in being contact when we’ve updated our options for the season please ask to be adding to our mailing list.